“Er, guys, I think I’ve just deleted all our slides…” From right to left: Martin Stack, Shiho Matsumi and me at the 2015 ATEM National Convention. Professor Makoto “Max” Kurata, the ebullient president of the Association for Teaching English through Movies (ATEM), called it both an “academic pow-wow” and a “pedagogical rendezvous”… My University of Shiga Prefecture colleague Martin Stack, our wonderful student Shiho Matsumi and I had a great time at the ATEM National Convention last week (7th August 2015, Kyoto Women’s University). Professor Koji Morinaga (Doshisha University), whose presentation on the development of reading materials covered no less than 15 movies – possibly an ATEM record! 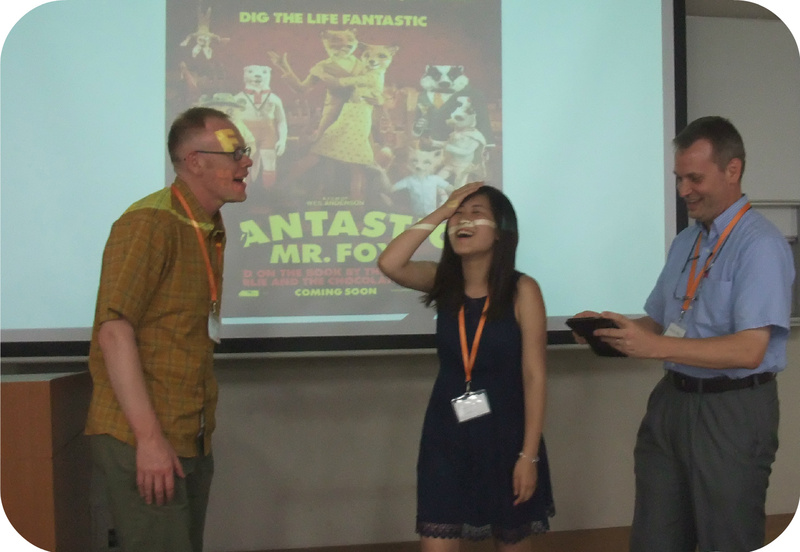 This entry was posted in Presentations and tagged ATEM, Fantastic Mr. Fox, Hero's Journey. Bookmark the permalink.